Our Beginning Prepper’s Wish List is a great place to start shopping for someone new to prepping. Or perhaps you want to start getting your family’s 72 Hour Kits together. 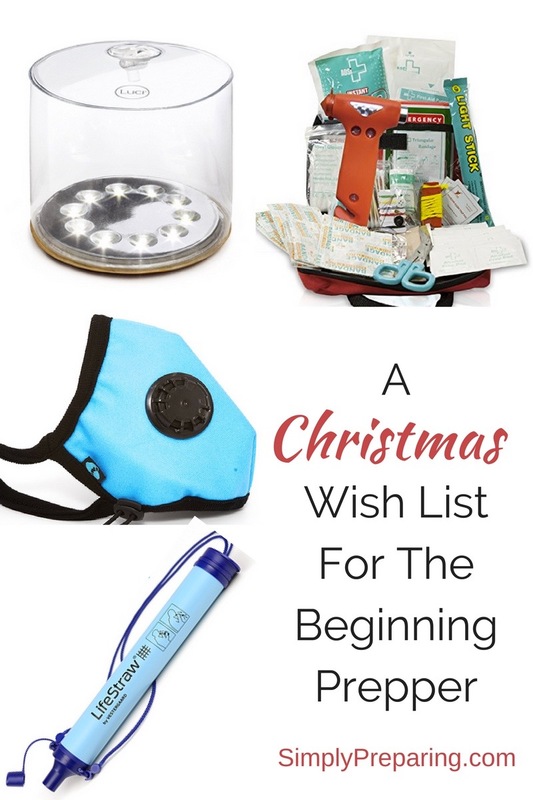 You’ll find our favorite stuff here on our Beginning Prepper’s Wishlist! 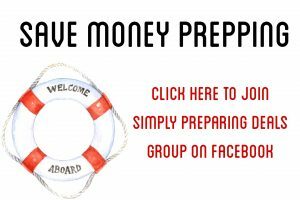 Heck, even experienced Preppers may discover some must have gear to make surviving Armageddon more fun. A couple of *this post contains affiliate links 7 Gallon Reliance Products AquaTainer Ridged Water Containers would get a Beginning Prepper’s emergency water storage on the right track! These Datrex emergency water packets are just the thing to get you through 72 hours with your 3 Day Kits. I like these because they can mold themselves around other items in your bug out bag. Blue Can Pure Water allows a Beginning Prepper to have a safe, great tasting emergency water supply that will last for FIFTY years! No chlorine, no fluoride, no BPA. Blue Can Pure Water can get take the heat and STILL taste great! Finally, both aLifestraw personal water filter and a Lifestraw family sized water filter are just the thing for a Beginning Preppers Wish List! I have both the personal Life Straw and the Family Sized Life Straw as part of my preps. In case you are like me, an over achiever in the worry department, the Sunflair Water Pasteurization Indicator is a nifty little item that will allow you to double check if your water is safe to drink. I have a fear of trying to survive an emergency in the pitch black. Many emergencies happen at night, therefore having a solid stash of lighting possibilities in my emergency kits is a must. Our Beginning Prepper’s Wish List has some some great ideas for you! The Amerelle 71134CC Slimline Power Failure Lite is an emergency light that comes on when the power goes out. A necessity for blackouts, storms, disasters, and over achieving worriers. Every survivalist will love a Peak Plus Super Bright LED tactical flashlight. It is just the right size for keeping beside the bed, in the glove compartment of a car or in a 72 hour kit. Light weight and collapsible, my favorite Eteckcity LED Outdoor Lanterns are a standard for every beginning prepper. Don’t forget extra Amazon Basics AA batteries! Or am I the only one who does that? A MPOWERD Luci Inflatable Solar Light will rock the world of ANY Prepper. Seriously. Take a gander at a Goal Zero Torch With Integrated Solar Panel. A flashlight with a built in solar panel! What’s not to love? During the recent hurricanes people relied on their cell phones for important emergency information. But once the power went out, so did the opportunity to recharge those phones. Mophie Powerstation 8x Dual USB External Battery for Smartphones and Tablets will recharge most phones up to 8 times! You can even recharge two phones at once! Emergencies make me hungry. What about you? Our Beginning Prepper’s Wish List can help you satisfy those munchies! You can take a Gas One GS 3000 Portable Gas Stove camping OR use it inside to cook a quick meal. Yes, you read that correctly. This Butane fueled emergency stove can be used in doors! Grab some extra butane too! When a Beginning Prepper has hot water, they can make a hot meal using Mountain House freeze dried foods.Just pour the hot water right into the bag and ta-da! dinner is served! Dehydrating your own food is a terrific skill for a beginning Prepper that reduces the cost of building a stash of long term food storage. Imagine being able to preserve your own food simply and inexpensively. I got started dehydrating with a Nesco Dehydrator, which is one of the more inexpensive options available. When my dehydrating habit…..er……..skills increased, I added an Excalibur to the family. Excalibur’s heat from the back to the font, which allows all the shelves to dry without needed to rotate trays. The square trays of the Excalibur makes it easier to get more food on a tray too. 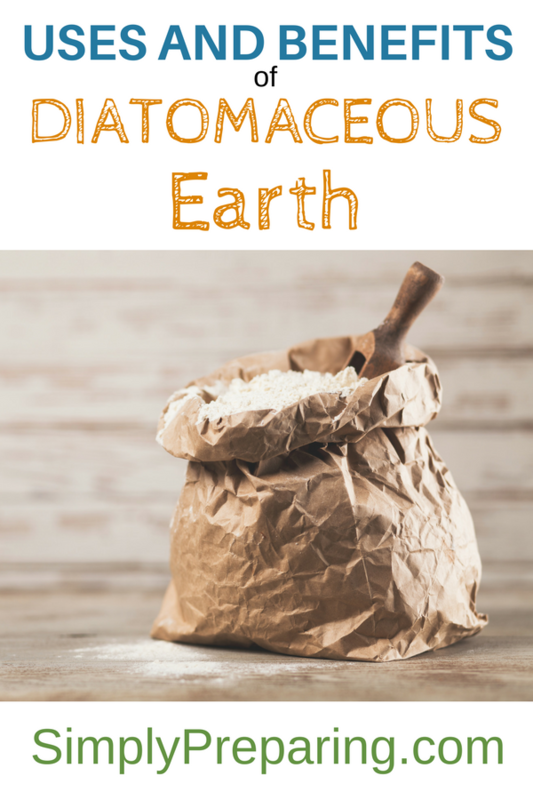 A favorite book on how to dehydrate food can be found in The Ultimate Dehydrator Book. Mine has become like an old friend, as I refer to it so often. Emergency Sleeping Bag. Made out of a thermal blanket material, the TACT Bivvy by Survival Frog provides a tear-resistant, water proof, weather-resistant protection that you can climb into just like a sleeping bag. Military Grade, Heavy, Washable Wool Blanket. Wool is antibacterial, temperature regulating and water proof. Zippo Hand Warmers have the ability to provide gentle warmth for 12 hours. Survive the cold of winter with a Portable, Indoor-Safe Radiant Heater like Mr. Heater. I always think better when my teeth aren’t chattering. 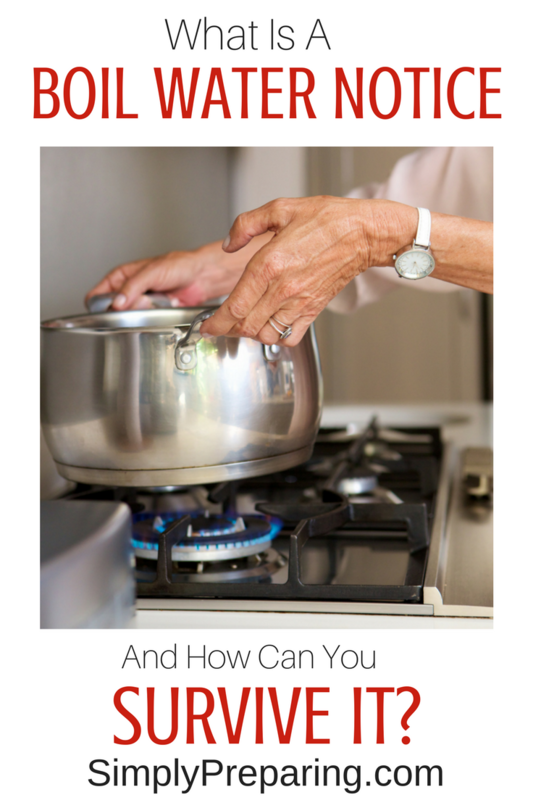 Freezing through an emergency isn’t necessary when preparations have been made in advance. I love the Cambridge N99 Washable Respirator, and it’s ability to go for up to 300 hours before the filter needs to be changed. Lab tested British military filtration technology filters almost 100% of pollution, gases, bacteria and viruses. The Turquoise is my favorite! What’s yours? Here is a simple medical kit to add to add to your emergency vehicle kit. 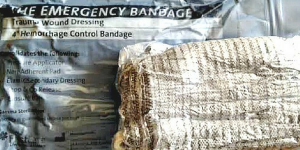 Here’s a first aid kit to hang off of your 72 Hour Kit for quick and easy access. Spyderco’s Deica4 Light Weight Plain Edge Knife is the perfect Every Day Carry knife. Does your Beginning Prepper need a way to keep their new knife sharp? A Lansky BladeMedic is a great choice for a knife sharpener light weight enough to fit into a Bug Out Bag. World’s Loudest Emergency Whistle. No 72 hour kit would be complete without the ability to let people know where you are. The Holidays are a wonderful time to reflect on the past year and look forward to the new. I hope your New Year includes the peace that being prepared brings. Merry Christmas!